Constitutional Supremacy - A Revisit is a collection of essays on the underlying theme of courts, constitutional issues and constitutional adjudication. Institutions and systems are of abiding value in a constitutional democracy which can work only under institutional safeguards. Law is the principal institution through which a society can assert its values. Constitutionalism and the rule of law facilitate a democratic political system. The relation between the various institutions is not only legal but political; the legal and the political processes are intertwined. Constitutional adjudication is, at least to some extent, political. It is and always has to be statecraft. It is also a dynamic interaction between the different branches of government. There has to be a lively discourse in which all this is constantly evaluated and readjusted. While a superficial answer to the question about the Supreme Court’s role is that the Court is for judicial interpretation of the Constitution, a more relevant answer would have to explore the meaning of judicial interpretation. It is necessary and wise to recognize that there can be no legal solution for every problem. The book addresses these issues. 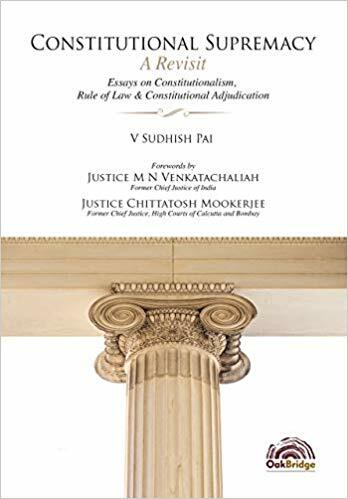 The author’s efforts at critical examination of constitutional issues and evaluation of public law pronouncements are aimed at the cultivation of constitutionalism. The insights in the book will inspire lawyers, judges, legal academics, students, researchers, policy makers and interested citizens.